Great customer service and goes beyond for anyone in need of a translation. “Sarah translated an immigration form for us where every single word was translated properly and promptly. With great business ethic, she was able to get the work done overnight (because it was urgent and I didn’t give her much time in advance). I’m truly grateful for all her hard work and dedication in getting my translation ready. Sometimes a general overview, or Summary Translation is the best route. If you just need to know what something says but don’t need a fully rendered translation, then the Summary Translation will get you the info you need at an affordable price. You can compare documents or get the gist boiled down into bite-sized pieces. Make sure your content is flawless and to the point. If English isn’t your first language or if grammar and spelling are not your forte, Shark Translations will give you a fresh set of eyes to make your text smooth and polished. If you need to get issues resolved via notarized documents with consulates, courts, counties, etc., Shark Translations provides mobile Notary Public services for Portuguese, Spanish and English language documents in the State of Oregon. You send me your file to be translated along with your needs and requested information. Within 1 business day, I’ll go over it to assess its complexity. You will receive a detailed assessment, quote and timeline. We will go over the options to agree on the scope of work, pricing and project delivery date. Work begins with updates at intervals as needed. Be prepared to answer questions about the text to clear up any ambiguities and to edit it for the target readership. Once completed, the translation is combed over with fresh eyes to ensure word choice, grammar, and spelling. Formatting to mirror the source file is performed. Files will be sent to you via email attachment or Google drive. If requesting hard copies, you will receive a tracking number either via UPS or USPS. Excellent work, understood our needs and delivered on time. For files that need to be impressive for your audience. Includes research, translation, editing, proofreading and formatting. Final price depends on: subject, complexity, timeline and post-edits. If you just need to know what something says, or compare documents, but don’t need a full written translation. You will receive a report of the main points and pertinent details, either in writing or verbally. Get your text reviewed to ensure the writing is clear, cohesive and error-free. Don’t let typos stand in your way of success. Documents returned with Track Changes. Notarizations of Portuguese, Spanish or English language documents. Required to be done in-person. $10.00 per signature. By appointment only. $20.00 travel charge for 97213, 97215, 97232 zip codes. $30.00 travel charge for other zip codes within Portland city limits. Outside Portland: $40.00/hour + $0.58 per mile of travel. Oregon only. Shark Translations will guide you to the smoothest solution whether it’s with a fully rendered translation or a simple proofreading. 1. How much is a typical birth/death/marriage certificate? $50 -$150, depending on whether it’s long or short form, if formatting is an issue, source file type, how many copies are needed, deadline, etc. 2. How much is it to translate a 36 page document? I need to see it first. Send it to me and I’ll get back to you quick. 3. Can you translate an 88 page legal document by Monday? No. You could parcel it out among different translators but you can’t ensure consistency of terminology or style which is imperative to keeping your document functional. If you just need a portion of it translated, we can review it and narrow down the important parts, which could potentially be translated by Monday. Send it to me and tell me why you need it and what you’re looking for. 4. Can you write a letter for me? Yes. Let me know what it needs to say, to whom and we’ll get it sorted out for you. 5. Where do you do notaries? In the Portland metro area, by appointment. 6. Can you notarize documents in Portuguese? Yes. Email, call or text to set up a time. 7. How are words counted? By the number of words in the source text. Therefore you will always know your price up front before proceeding. Of course it depends on the text, but roughly 2,000 words/day without incurring rush surcharges. Cash, check payable to Shark Translations, or credit card via Swipe. Paypal as a last resort. 10. Why the name "Shark Translations"? Sharks are the guardians of the ocean and master navigators. People are often misjudged by their lack of language skills, spelling and grammar like sharks are misunderstood as killer beasts out for your blood, when really they are flawlessly designed survivalists at the top of the food chain. Like a shark navigating the ocean, Shark Translations guides people through language barriers by conveying ideas and messages clearly, flawlessly, professionally and to the point. Any other questions you’d like to see answered here? 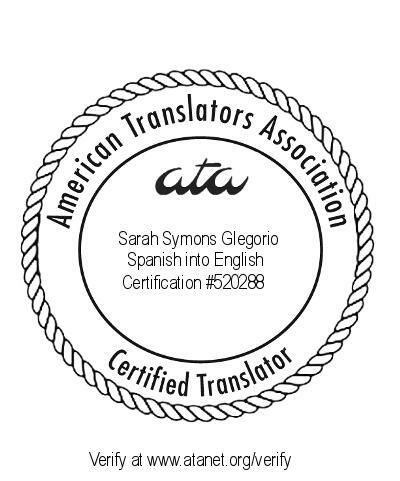 ATA-Certified, Portland-based translator providing translation of texts from Spanish and Portuguese into English to help you get business done. Why is it important to have clear language and translations? In a language that is so widespread, yet as fickle as English, a comma can be the difference between an invitation and death (“Let’s eat, Grandma!” vs. “Let’s eat Grandma!”). Even a simple apostrophe can cause enough confusion to lose a reader and muddy the point you’re trying to convey. Now imagine all the mishap that can occur with poorly translated legalese! Doing business should be enjoyable, not hiccupped by unnecessary stressful obstacles. This in turn will lead to improved relationships, better health, informed decisions and more meaningful interactions and transactions. You can count on Shark Translations for thorough research, background knowledge and writing skills to understand and smoothly convey your texts in English. My goal for Shark Translations is to be your go-to for language solutions. Business should be done smoothly, clearly, efficiently and conscientiously. Imperfect English should not be a source of miscommunication, frustration or disrespect. You should be focused on your passions and making a living and not worrying about if your spelling and grammar are perfect. ...especially those who promote mindful, eco-conscious choices and practices. Forms, official documents and immigration translations to help families be together. Website translations to increase your audience by up to 400 million viewers. Educational & corporate training materials to ensure all your employees are on the same page. Translation of contracts and transactional documents to save you time with a bilingual dictionary. While at university I majored in Spanish, minored in Business and dabbled in some French, Portuguese, Italian and American Sign Language. In the beginning, the translation projects I did were a labor of love, as I didn’t even keep track of how long I spent on them. Over the course of my career, I’ve lived and worked in the USA, Spain and Brazil and have gained experience in a variety of industries. Years of experience as an English teacher has given me intimate knowledge of common errors and how certain Spanish and Portuguese nuances are typically expressed in English. I’ve also had years of experience in lending, non-profits, real estate and internal audits which have garnered practical experience with commercial documents, contracts, credit, financials, nitty-gritty details as well as utmost confidentiality, compliance and tact. With my writing I’ve helped people reach new audiences, get their mortgages modified, repair their credit, educate their workers, get taxes waived, score free airline tickets, and earn promotions and bonuses. Just imagine what I could do for you. A language blog that also dives deep into business, educational, and oceanic topics. We’ll explore language curiosities and surf up articles on travel and personal improvement. It all depends on the tides and currents. You can expect new sightings quarterly. This New 4,000-Mile Trail Will Let People Bike Across The U.S. On One Path https://t.co/8WR5JgUSXU New bucket list item!! Sign up with your email address to receive special promos, new blog posts and other updates. Your information will not be accessible to anyone but Shark Translations. Now accepting new projects for May 2019.